Preface, I do know the rule that if a pin slides off-spot, it must stay in that spot per the USBC. Also, I know that if the machine knocks down an off-spot pin that it must be reset where it originally was before the shot was taken per the USBC. This is about what I noticed the pinspotter was doing while practicing yesterday. I had two shots where a pin slid off-spot on the same lane and the pinspotter (AMF machines) was not able to pick up the pin and the pin stopped the pinspotter from moving any further than the top of the pins. However, the off-spot pin was not knocked down. Now, any other time I'd have to call the desk for an off-spot since the pinspotter would just move back upwards with the sweep staying down in front of the pins and the mechanic would have to lift the sweep from the back. However, yesterday the pinspotter went back up and the sweep cleared all pins off the pin deck and moved back up without any intervention from the mechanic. This means that the off-spot pins would have to be reset back at their original spot. Being it was practice I didn't bother resetting the pins but it would be more annoying in league and result in more time taken for the mechanic to reset pins than it would have for the sweep to just be lifted. This brings up two questions I want to ask. How do the machines where you bowl handle this? Do you feel that the sweep knocking down off-spot pins that were not knocked down by the pinspotter is behaving in a way that is "not in the spirit of the rule" for off-spot pins considering that they could have been left standing? 5 years New Brunswick equipment. When a pin is off spot, and out of range to be picked up, the rack stops on top of the pin and it blacks out. This can be managed by the desk people, who can instruct the rack to be raised and lights turned back on. As for the spirit of the rule?? It's a gift, take it. It was regarding a 4-7 split, but one of the pins was out of range and knocked down by the pin-setter so had to be replaced. When a pin is off spot, and out of range to be picked up, the rack stops on top of the pin and it blacks out. This can be managed by the desk people, who can instruct the rack to be raised and lights turned back on. Yeah, other than the lack of blacking out that's how it used to happen at this center for the last 28 years. It might have not been a gift for me in one case. I had left a 4-9 split and a pin smacked the 4 pin from behind and slid it nearly directly forwards to where it couldn't be picked up. It would have probably been the easiest 4-9 I had ever shot. Being it was practice, I took my second shot with no pins on the deck and happily took my phantom 4-9 conversion. Mmalsed, I also saw that 10 pin puzzler (it's a good series). However, the setter caused it to fall while trying to legally reset the off-spot pin in the 10 pin puzzler example. I'm wondering why at my center the sweep suddenly started to knock down legally standing off-spot pins that were blocking the pinspotter from being able to pick up pins at all, something it never used to do. It's a setting on the machine, if the automatic scoring system allows it. If not, out-of-ranges are swept away and the original leave is reset. Some houses do it for safety, some do it because they don't know how to set the machines. In CA, I think CalOSHA requires machines on both sides of the out-of-range be powered off before a human can climb underneath to clear away dead-wood. It's probably a management decision to wipes those out-of-ranges away to save time. In the 60's, we just powered off, then used a long stick with a coat-hanger on the end to reset pins or clear the dead-wood. Nobody had to ever get underneath a machine. 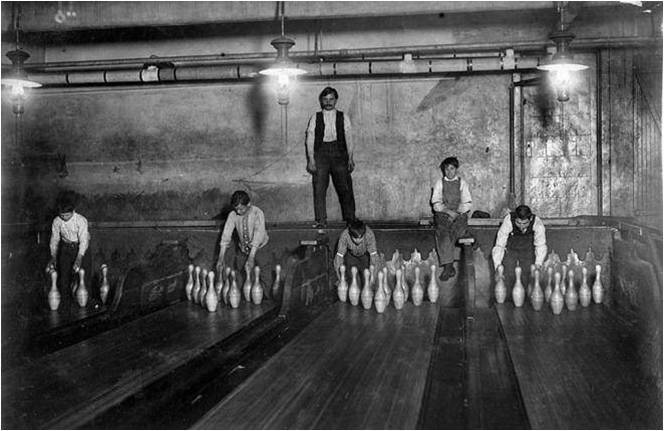 Of course, the pin-boy had to be young and agile. Today, with $15 minimum wages, most places don't have extra employees that aren't needed. Mechanics do that stuff and their time costs more, so the out-of-ranges are just wiped-off and reset. A bowler on our lane had this happen to her this week. The 6 pin moved in between the 6 and 10. The pinsetter came down and stopped on the pin. The lane man removed deadwood and raised the pinsetter. The pin never fell and bowler proceeded to bowl. Generated in 0.017 seconds in which 0.002 seconds were spent on a total of 14 queries. Zlib compression enabled.